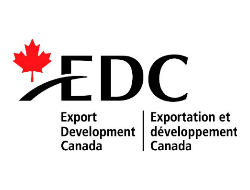 Export Development Canada is Canada’s export credit agency. Their job is to support and develop Canada’s export trade by helping Canadian companies respond to international business opportunities. They’re a self-financing, Crown corporation that operates at arm’s length from the Government. They provide insurance and financial services, bonding products and small business solutions to Canadian exporters and investors and their international buyers. They also support Canadian direct investment abroad and investment into Canada. In 2016, they helped more than 7,150 Canadian companies do business in over 200 countries. The majority of these companies were small business, and more than 30 per cent of this business was conducted in fast-growing emerging markets. Using their financial products and services, their customers’ export sales and investments totaled almost $99 billion. They estimate that this helped generate $63.9 billion of Canada’s GDP, contributed more than 4 cents for every dollar earned and helped sustain 525,400 jobs.